Introduction: Standardized guidelines for treatment of fracture-related infection (FRI) are lacking. Worldwide many treatment protocols are used with variable success rates. Awareness on the need of standardized, evidence-based guidelines has increased in recent years. This systematic literature review gives an overview of available diagnostic criteria, classifications, treatment protocols, and related outcome measurements for surgically treated FRI patients. Methods: A comprehensive search was performed in all scientific literature since 1990. Studies in English that described surgical patient series for treatment of FRI were included. Data were collected on diagnostic criteria for FRI, classifications used, surgical treatments, follow-up protocols, and overall outcome. A systematic review was performed according to the PRISMA statement. Proportions and weighted means were calculated. Results: The search yielded 2051 studies. Ninety-three studies were suitable for inclusion, describing 3701 patients (3711 fractures) with complex FRI. The population consisted predominantly of male patients (77%), with the tibia being the most commonly affected bone (64%), and a mean of three previous operations per patient. Forty-three (46%) studies described FRI at one specific location. Only one study (1%) used a standardized definition for infection. A total of nine different classifications were used to guide treatment protocols, of which Cierny and Mader was used most often (36%). Eighteen (19%) studies used a one-stage, 50 (54%) a two-stage, and seven (8%) a three-stage surgical treatment protocol. Ten studies (11%) used mixed protocols. Antibiotic protocols varied widely between studies. A multidisciplinary approach was mentioned in only 12 (13%) studies. 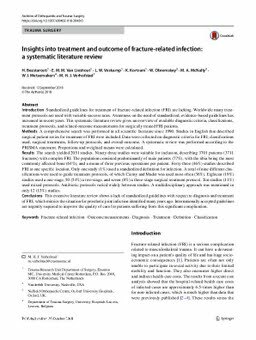 Conclusions: This extensive literature review shows a lack of standardized guidelines with respect to diagnosis and treatment of FRI, which mimics the situation for prosthetic joint infection identified many years ago. Internationally accepted guidelines are urgently required to improve the quality of care for patients suffering from this significant complication.